Holly Holm and her promoter don't rank too highly on Dana's list of prospects. Former women’s boxing champion and current MMA bantamweight hopeful Holly Holm may be touted as one of the top fighters in the sport currently not competing in the UFC but it doesn’t look like that’s going to be changing any time soon. Holm’s manager Lenny Fresquez recently told FOX Sports that the former 18-time champion wants to be in the UFC, but not without a financial windfall that makes sense to them to give up the purses she’s able to earn outside the promotion. 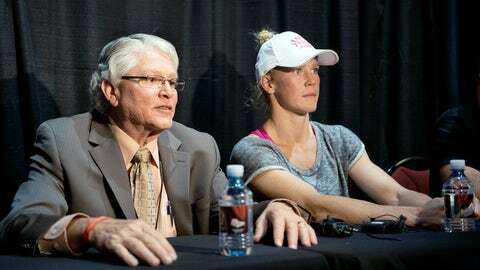 According to Fresquez, Holm routinely makes between $30,000 and $40,000 a fight and has been offered $250,000 for a boxing match as well. While UFC president Dana White hasn’t personally been involved in the negotiations involving Holm, he believes her manager is out of his mind if she’s landing those kinds of dollars for her first fight in the Octagon. It has nothing to do with Holm not being a great fighter, but White says like so many rookies that compete outside the UFC — she’s unproven. He’s a lunatic. From I hear and I don’t know the guy, but from what I hear he’s a typical boxing promoter. "He’s a lunatic. From what I hear and I don’t know the guy, but from what I hear he’s a typical boxing promoter," White told FOX Sports Thursday. "The girl hasn’t fought anybody and they’re talking about all this stuff. "There’s all kinds of hype around people — you find out what’s real and what’s not real when somebody steps into the UFC." It’s not likely White or anyone at the UFC is going to lose sleep about not being able to add Holm to the roster, and unless negotiations go in a different direction soon it’s safe to say she won’t be competing in the Octagon in the near future. Holm is currently 6-0 in her MMA career with five knockouts or TKO to her credit.